I am still experiencing indexing problems with the latest build. I've created a linked attachment to a Word document (a book catalogue), but am finding the search results very selective. When I do eventually find a term which is highlighted in the "Search Box", I can invariably select another (unhighlighted) term from the same entry and search on that only to be informed that there are "No Results Found". If the text is displaying in the search preview, you should definitely be able to find it in the search. Note that some terms are too general to be searched, such as "a" or "the". Can you post a screenshot showing the term in the search preview and then a second with the "no results" found message? Many thanks for your reply. Please find below an attached image showing a valid search result, and then a second search on one of the clearly visible words in the first result, but which then returns "No Results Found". Thanks for posting the screenshots. Any chance you can send a copy of that document to support@thebrain.com? I would guess that there is a character before or after the word "Hawke" which is not a normal space and is thus not getting interpreted as a word-break. If you send it to us, we can find out what the problem is. I've e-mailed the file to Support. Could the problem be one of "Relevance"? It appears that, for a search result to be positive, a term has to appear at least three times in the linked file. 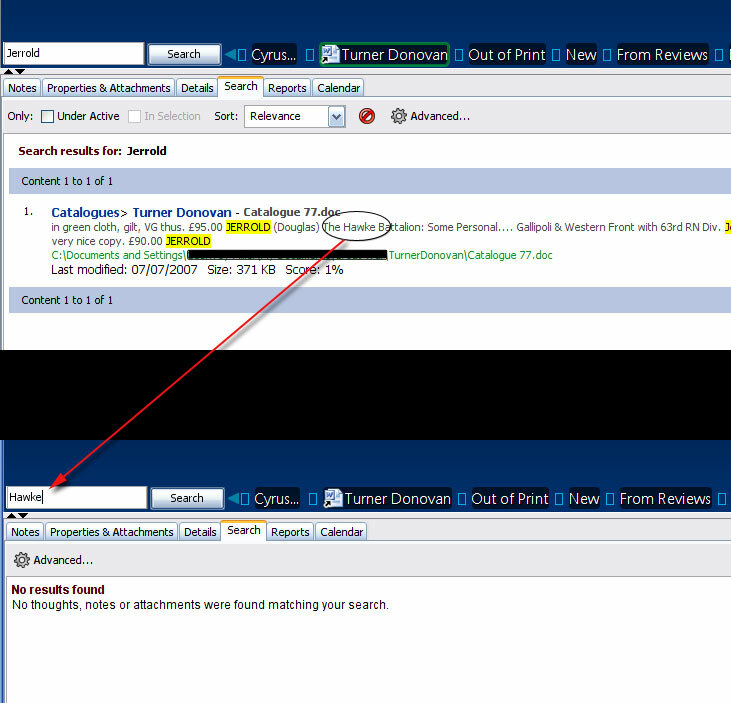 Those terms appearing only twice (or in some cases, twice) in the Word document, invariably return "No Results Found". Those terms appearing only once (or in some cases, twice) in the Word document, invariably return "No Results Found". The problem seems to be that the term you are searching for is not common enough in the document to return a score of at least 1% so it is not shown. Basically, the density of the search term in a document determines it's score. So in a very large document, your term needs to appear more than once. I've asked Daniel, our search expert to look into potential ways of getting around this. Open the SearchEngine.xml file in the PersonalBrain/res folder into Notepad. Edit the value for the minimumScore setting from 0.01 to 0.00. I'm a bit puzzled, i thought searching would work only in text based attachements? If Word documents can be searched are there more file types that work? Besides are there differences in the windows/mac/linux versions regarding the search capabilities? On Windows, Pro and Core versions search many file types, including MS Office documents, PDFs, and many other document formats.